Salomon XA PRO 3D are stability trail running shoes. 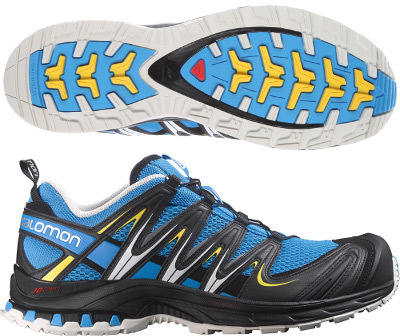 The robust Salomon XA PRO 3D is more a trekking than a trail running shoe but valid to run as well. Very well protected, really stable and pretty heavy (compared to trail running shoes) it is the perfect choice for those users looking for pronation control to enjoy running/hiking off road. There is also an edition available with Gore-Tex® (GTX) to protect feet during extreme weather conditions. Most important features in XA PRO 3D are comfort and fit, so upper is a key element to deliver them. It is made of breathable mesh with several overlays to protect against external elements including toe cap. Quicklace™ lacing system guarantees a perfect fit and excess can be stored in own lace pocket to prevent snagging. Like many other Salomon shoes, the XA PRO 3D features OrthoLite® insoles which not only provide extra cushioning but also moisture management and antimicrobial properties. Another key factor is great stability from 3D Chassis and double density EVA foam in the midsole for pronation control. Contagrip outsole is made for traction on every terrain but keep an eye on durability.